Meanwhile, reunited with Liam, the boy she would--and did--sacrifice everything for to keep alive, Ruby must face the painful repercussions of having tampered with his memories of her. She turns to Cole, his older brother, to provide the intense training she knows she will need to take down Gray and the government. But Cole has demons of his own, and one fatal mistake may be the spark that sets the world on fire. Admittedly, the conclusion of The Darkest Minds trilogy was pretty exciting. While The Darkest Minds was never the best series or dystopian to hit the YA trends, it had the fortune of including elements that hit the right marks for me, personally. While there wasn't much ado about the concept or the story, or even the probability of a dystopian world unfurling in the manner of which the world in The Darkest Minds had done so, I still managed to love it. Despite the fact that these weren't the best characters in the world, they somehow grow on you and you find yourself falling for each and every one of them before the end of the books come around. We were introduced to Ruby, Liam, Chubs, and Zu in the first book--a ragtag group of young, innocent teens with the misfortune of being forced into tragic circumstances as they run for their lives and dream about ways to right the wrongs committed in their world so they can have a better future, and try to survive day by day. The second book reintroduced the characters you fell in love with along with few others. But by now, a more realistic sense of "Action must be taken" has overcome most of our characters, and the dream for a better future is no longer just dream but an ambition. In the new fights, new friendships form and old friendships are reforged. I personally loved watching the friendships wind and knit so tightly together that you'd have to use force to pry them apart. It was heartwarming despite the bleakness of the situation these kids are thrown into in the fictional world of The Darkest Minds. The ending approaches with pretty much the same action-packed, constantly-in-motion activity that had transpired from Never Fade, spilling the continuation over in the the last book of this series. But this time, it seems like our kids have more of a direction... and yet, at the same time, very little action seems to occur, and we find ourselves struggling with the constant angst, the constant fear and danger, the constant idle planning and planning and more strategic planning before the ending finally rolls out some action. Ruby continues to struggle with her powers and the "monster" she believes them to be; in doing so, she continues to hold her friends at arms length, fearful of hurting anyone she loves, but at the same time, she yearns for their warmth and is loathe to part with them. 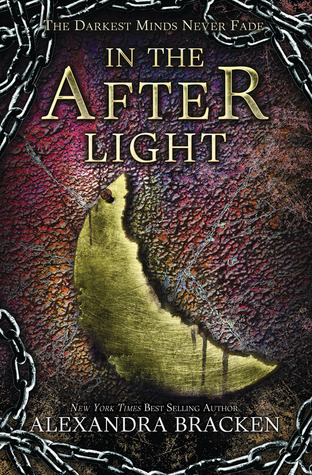 Liam's struggle was a little less emphasized, and I'm a bit disappointed that he doesn't get very much book-time in In the Afterlight. With his brother, Cole, and Ruby trying to take charge as the more powerful Psi kids (and the more dangerous ones) who have had training because of the Children's League, Liam is kind of left in the dust to find some way of feeling useful. Other conflicts arise as well, and somehow also end up being a bit much to process. And yet, I still found it all quite enjoyable. I think it had to do with all the character interaction and all the conflicting, emotional ties being unknotted, and all the secrets and the personal dilemmas finally finding peace with one another. To watch this group of kids get together, fight and make up and continue to remain together, willing to stick by each others' sides despite all the differing views and conflict of interests and secrets... it was pretty nice. To date, my favorite relationship in the world of The Darkest Minds is still between Chubs and Ruby. I don't know what it is about this pair that brings the FEELS surfacing when they interact. Don't get me wrong, I'm all for the romantic coupling of Ruby and Liam; but the friendship and the understanding between Chubs and Ruby just seems to outshine the rest of the relationships around them, whether best-friendship, sibling-love, or even the romantic pairings that occur. Chubs is the intelligent, level-headed big brother who just gets it, and despite having been hostile to Ruby in the beginning of the series, I love how he's grown to just accepting whatever she does, and just knows her well enough to remain by her side even when others suspect her actions. Of course, he's also great enough to call out her fallacies with hopes that she'll think long and hard about her decisions before making them. Not to say that the others (Vida and Zu) don't do the same, but there's something powerful about having Chubs on your side that just feels right. He's like the voice of reason, a protective guardian... and I love him for that. And now that I've made a whole lot of nonsense sound like more nonsense, I'll just end off this review. In the Afterlight, as well as the full Darkest Minds series probably doesn't rank high on many people's list of good YA dystopian. Goodness knows I've read better stories with better concepts. But it's written well with some thoughtful quips and discussions and ideals here and there. And most importantly, it's got a heartwarming feel to it presented through the characters and their love for one another through the struggle of a collapsing world around them. The characters aren't the best, but on paper they can be quite complex if given the chance. Most importantly, I personally grew to love them all and I DID find enjoyment in this book.